Mobikwik is now offering special cashback offer on Bus Ticket bookings. By using latest Mobikwik Bus Coupons and offers you will get maximum discounts on your bus ticket bookings. They are now offering 20% upto Rs 100 cashback in Mobikwik wallet on your booking. This offer will work for both old and new users of Mobikwik. So avail the offer today. 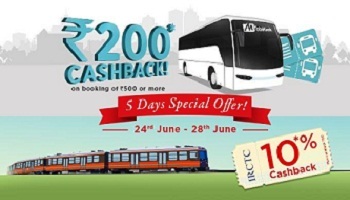 Do bus ticket booking of Rs.20 or more with given code and get 100% Supercash. Max cashback will be Rs.500. Get 100% Supercash on minimum bus booking of Rs.500. Max cashback will be Rs.500. Mobikwik makes your BUS Ticket bookings more easy with lots of Supercash offers every month. Simply start using for your travel and get cashbacks and discounts on every booking. You can directly make payment from Wallet or Net banking or Credit & Debit cards. You can select BUS according to time schedule and pricing so you can choose from saving money to quick travel options. There is always a max limit on all cashback offers. Always read the terms carefully before using the listed promo codes. Get flat Rs.300 SuperCash on JIO Rs.398 plan on MobiKwik website and app. JIO100 – Use this code and get flat Rs.100 on JIO plans of Rs.149 and more. The minimum amount spends to redeem JIOTALK coupon is Rs.398. Maximum cashback amount on JIOTALK is fixed at Rs.300. Coupon redemption & Payment must be done on MobiKwik’s Android, Windows, iOS App or website. You can redeem the code only once/ user. Good service and offers on Mobikwik. Email me when new promo code arrives. Guys.. don’t use this promo code.. It is not working.. This is official offer from Mobikwik.